The remarks, reminiscent of those of Soviet Premier Nikita Khrushchev’s vow in 1968 to “bury” the West, is likely to raise tensions with North Korea, whose nuclear-weapons and missile programs have raised the alarm in Asian capitals and Washington. North Korea, with its regular battery of missile tests, as well as a recent nuclear test, is believed to be close to—if it doesn’t already possess—the ability to strike the United States with an intercontinental ballistic missile armed with a nuclear warhead. 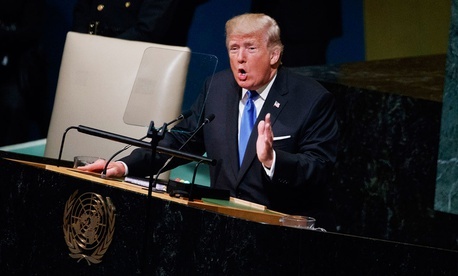 Trump urged the UN and its member states to “do much more” to “isolate the Kim regime until it ceases its hostile behavior.” He thanked China and Russia for their votes to tighten sanctions on the North, but it is those two countries—both veto-wielding members of the UN Security Council—that are most reluctant to press for any international solution that would weaken or destabilize North Korea. Trump’s address was a marked departure from Monday’s comments at the UN, an organization he previously dismissed as “a club for people to get together, talk, and have a good time.” On Monday, he said the UN “was founded on truly noble goals … [it] has not reached its full potential because of bureaucracy and mismanagement.” His departure in tone closely tracked with speeches he made early on in his presidency. Trump was praised for his remarks in Saudi Arabia and Israel, but was criticized for his subsequent speech in Europe where he failed to endorse NATO’s commitment to mutual defense. Trump, whose speech was reportedly drafted by Stephen Miller, his adviser, also listed Iranian transgressions in the Middle East, calling Iran a “reckless regime … that speaks openly of mass murder, vowing death to America, destruction to Israel, and ruin for many leaders and nations in this room.” He said Iran funds terrorism, supports Syria’s Assad regime, fuels Yemen’s civil war, and undermines peace. He also provided clues to what his administration might do with the nuclear agreement that Iran signed with the United States and other world powers in 2015. Trump’s speech was billed as a testament to his commitment to national sovereignty, and it was a topic the president, who campaigned on a theme of “America First,” raised even as he outlined his view of how the world can tackle common challenges. Trump also listed other challenges the world faces, including terrorism, Russia’s interference in Ukraine, Syria, and “uncontrolled migration,” which he said “is deeply unfair to both the sending and receiving countries.” But it’s his remarks on North Korea that are likely to receive most attention. “If the righteous many do not confront the wicked few, then evil will triumph,” Trump said, calling for international cooperation on North Korea, which has become a test of his young administration’s policies. Before Trump’s remarks on Tuesday, his administration, after several false starts, appeared to have coalesced around a common message on North Korea: one that favored diplomacy to defuse the threat posed by Kim Jong Un’s nuclear and missile programs, while keeping all options on the table. After the president’s remarks, it’s once again unclear what the U.S. policy on North Korea is.